You will not mistake a Division Furtive for any other watch. It is a huge black disk with a gold text on its matte black dial and two rows of white LEDs. It looks like something from that year 2000 – as it was imagined in 1970. Gabriel Ménard designs and assembles these watches at Division Furtive headquarters in Montreal, Canada. At least that is what he tells us. I suspect it may actually be a secret laboratory inside a dormant volcano, but I cannot confirm this. 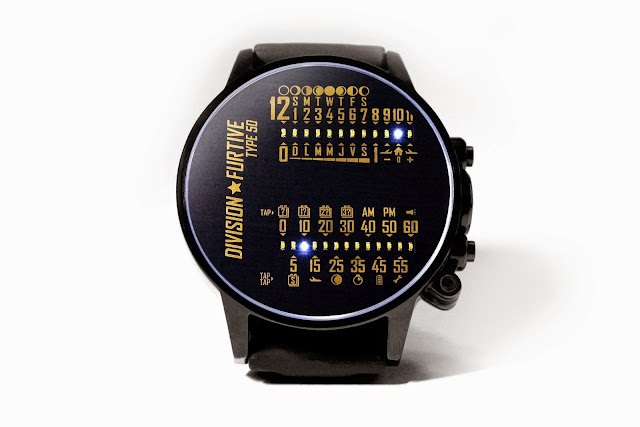 Following the success of the Type 40 and the electro-mechanical Type 46 models, Division Furtive has launched the Type 50 on Kickstarter. Production is limited to 1000 units. The Type 50 is an evolutionary step from its predecessors. It still bears the unique, retro-futuristic dual linear display, but incorporates such features as a stainless steel case, temperature-compensated timekeeping circuitry, high-efficiency white LEDs, improved motion and tap detection, backup battery, improved battery life, and an integrated flashlight. The watch has a massive 50x16mm metal case composed of stainless steel, brass, and zinc with a black PVD coating. Inside, an AAA battery powers the circuitry for up to two years before replacement. 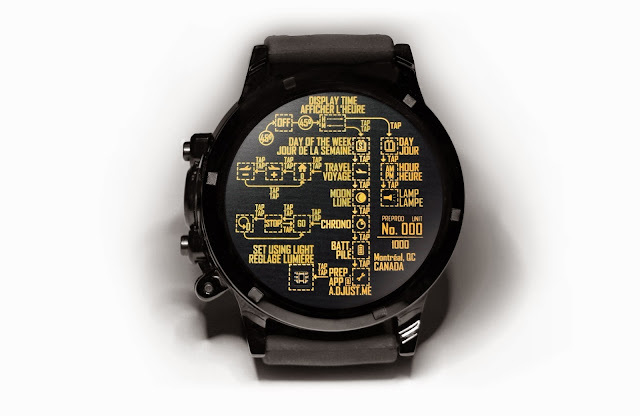 The case back is decorated with an operational flowchart that underscores the techno-wizardry of this piece. It will come on a silicone strap. A leather band and metal bracelet are potential stretch goals. To tell the time on a Type 50, you tilt your wrist just like any other watch. The motion "wakes" the display. Hours flash across the top bar, minutes below. The minutes are only marked in increments of five, so the lights pulse left and right to show the number. Tapping the mineral crystal activates additional functions including day and date, 12-minute chronometer, moon phase, multiple time zones, power reserve, and a flashlight. Perhaps the most intriguing feature is the "set by light" function. 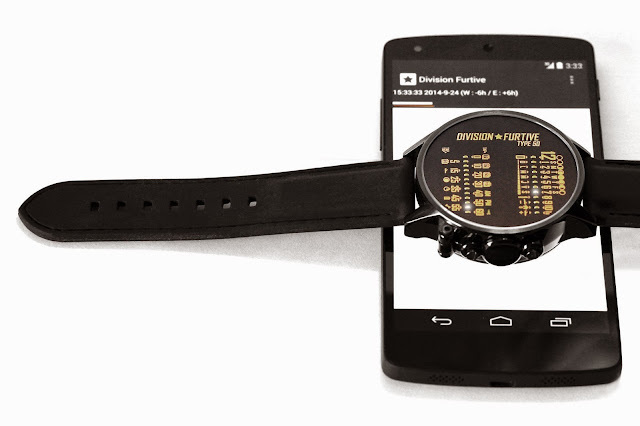 Using your smart phone or computer, the watch reads a light sequence to synchronize date, time, and moon phase. I have not yet tested a Type 50, so I have no way to tell if these functions are practical or not, but the display appears rather intuitive and it certainly gets points for creativity and style. Indeed, style is what the Division Furtive is all about. I showed the Kickstarter campaign to some friends this weekend, and while one poured over its technical novelty, the other took one look and asked, "How is this better than a normal watch?" Excellent question. Perhaps it isn't better, just different. Sometimes, different is enough. The watch will retail for $395 CAD (@ $352 US). As of this writing, Kickstarter pre-orders start at $245 CAD (@ $218 US). Stretch goals will include a front sapphire crystal, an extra leather wristband, a back sapphire crystal, a butterfly clasp and an extra metal wrist band. Finally, if you choose to back the project with a dollar, they will post a picture of your cat, which is both awesome and somewhat super-villainous. I am beginning to like Division Furtive. Their Francophone-espionage name, Daft Punk aesthetic, techno-wizardry, and pro-feline policy add up to an offbeat and appealing package. For more information, check out the Kickstarter campaign, which will run until November 6th.